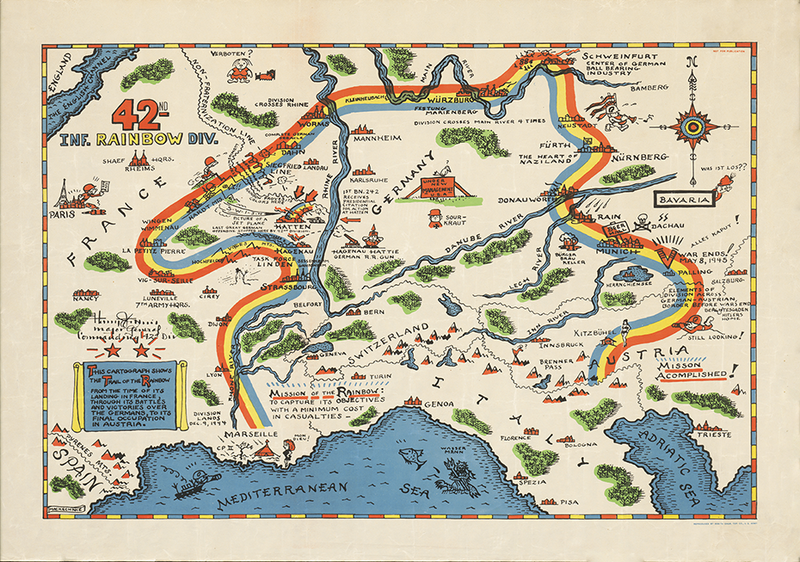 This vintage map chart the journey of the 42nd Infantry Division throughout Europe during World War II. The map can be zoomed in and purchased at HistoryShots.com. The three regiments and a detachment of the Division Headquarters arrived in France at Marseilles, 8-9 December 1944, and were formed into a Task Force Unden, under the Assistant Division Commander. Assigned to VI Corps, Seventh Army, the Task Force entered combat in the vicinity of Strasbourg, relieving elements of the 36th Infantry Division, 24 December 1944. Defending a 31-mile sector along the Rhine, north and south of Strasbourg, the Task Force repulsed a number of enemy counterattacks, at Hatten and elsewhere. After throwing back an enemy attack, 24-26 January 1945, Task Force Linden returned to Seventh Army Reserve and trained with the remainder of the Division which had arrived meanwhile. On 14 February 1945, the Division entered combat as a whole, taking up defensive positions near Haguenau in the Hardt Mountains. 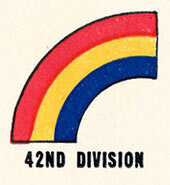 After a month of extensive patrolling and active defense, the 42d went on the offensive, attacking through the Hardt Mountains, broke through the Siegfried Line, 15-21 March, cleared Dahn and Busenberg, and mopped up in that general area, while the Third Army created and expanded bridgeheads across the Rhine. Moving across the Rhine, 31 March, the 42d captured Wertheim, 1 April, and Wurzburg, 2-6 April, after a fierce battle. Schweinfurt fell next after hand-to-hand engagements, 9-12 April. Furth, near Nurnberg, put up fanatical resistance, but was taken, 18-19 April, by the Division. On the 25th, the 42d captured Donauworth on the Danube, and on the 29th liberated some 30,000 inmates at Dachau, most notorious of the Nazi concentration camps. Passing through Munich, 30 April, it cut across the Austrian border north of Salzburg, 5 May, as the war in Europe ended.